1. "Happiness is not achieved by the conscious pursuit of happiness; it is generally the by-product of other activities." 2. 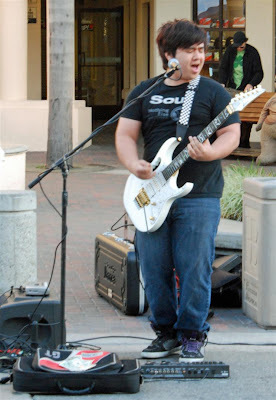 I enjoy checking out the Tuesday evening 'street fair' in downtown Huntington Beach on Tuesday evenings 'just for the JOY of it ... stopping to watch & listen to the entertainers who share their talents. 3. "Happiness is never stopping to think if you are." 4. This bear outside of the Rocky Mt. Chocolate Factory always makes me smile. I love his t-shirt too. 6. On Tuesday I purchased this new t-shirt for myself in the HB Store on the pier. I love the color and the logo ... just because. 7. This 'vendor' posed for a photo ... my sister & I each purchased a loaf of Jalapeño Cheese bread from him just for the JOY of it! Unfortunately MY loaf has no jalapeños so I plan to freeze it to thaw and return NEXT week for one with jalapeños. 9. These little birds sitting on the wire against the clear blue sky made me happy when I noticed them sitting there. 10. 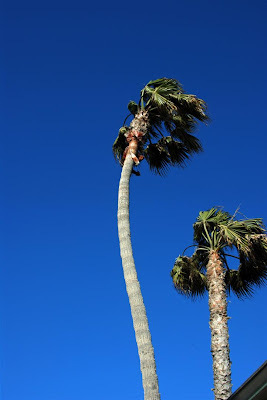 I don't really like wind much at all, but I did find the views of palm trees fascinating the past few days. 12. Sunrise is my favorite time of day and these views are from Wednesday ... taken from my front yard. for just a couple of minutes. "There is a wonderful mythical law of nature that the three things we crave most in life — happiness, freedom, and peace of mind — are always attained by giving them to someone else." I love quote number five about being happy if you want. Thanks. Great pictures and quotes. Happy TT. Love the quotes by Prévert and Barrymore - and the view from your yard. The only view I have is of a parking lot. Sky lights and window lights combine to make a cosy sense of home and beauty! Lovely collection of photos and quotes! love the quotes and pictures! You make me want to get my camera back out! Here is mine if you'd like to pop by. Hope to see you soon. All street fairs look the same. 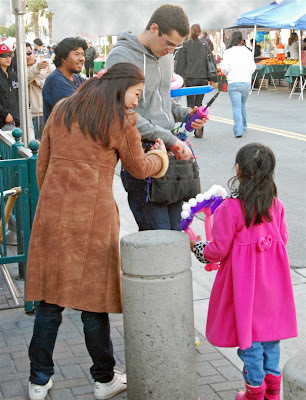 Balloon guy, overstuffed bear in a t-shirt, street band...fun times! I miss Huntington Beach! Added a few of your quotes to my collection. Well Ms. V....you've really made your week's entry VERY enjoyable. Now, hold on, I'll be there in a jiffy so I can go with you to buy some of that bread...WITH the jalapenos and cheese!!! Here's my 13 for fun this week. Come over and laugh a time or two. I always enjoy the company-- Have a great day!! I liked the palm tree photo, having come off of several months of cold and snow! The palms look heavenly! 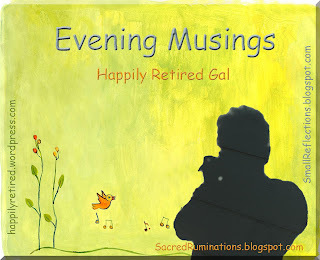 My TT is at http://bluecountrymagic.blogspot.com. You got some lovely shots there m'deario. 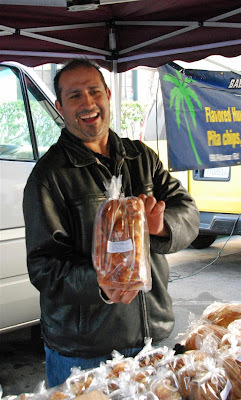 I love the one of the bread vendor - his smile is so sunny! Wonderful list. My brother use to live in Huntington Beach. I visited the Huntington Beach area back in the late 90s to visit an old friend...loved it there! What fun, varied pictures! I do adore the bear and would like him for myself! 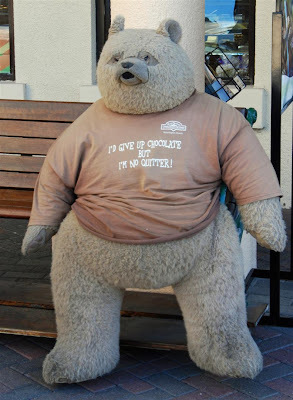 He's different than other bears, and how I love the T-Shirt! Mr. 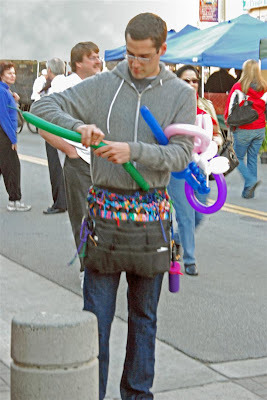 Balloon man is colorful, as well, with all those balloons attached to his waist. Curved reflections are a new take, very neat! Wish I could go! Thanks for starting my day with a smile. Fun post and as always, fabulous photos. Happy T13! So many delightful images! The palm trees look so tall from that view and also the sweet birds on the wire resemble musical notes. I love how you captured the sunlight shining in the house. Stopping by from Just For The Joy of It! I'm always so impressed how you find (with your eyes, mind and camera) the simple things that bring delight. I love to remember the moments, just like you're doing here. It warms the cockles of my heart! Love your beautiful early morning skies! The colors are so beautiful! Wonderful captures! Hope you have a lovely weekend! I love to see those puffy white clouds in the reflection of you car window I can almost touch them! Your sky shots are beautiful! These are all very nice pictures. The palm trees look like they are getting blown by the wind. What a great collection of photos! 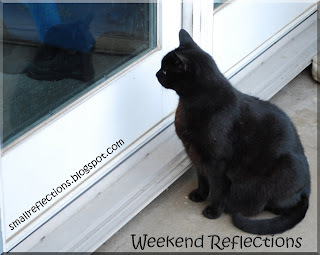 I love the big ol' bear and your photo for Weekend Reflections is perfect. Wonderful series of photos! The street fair looks like fun and I lvoe the T shirt. Your skies are looking beautiful. Just stopping by to tell you we will be in Huntington Beach later this afternoon. G'day ~ So enjoyed your thoughts that are provoking ... what a wonderful day you had. Love places like this. Northampton, my hometown and one of the spots I show frequently on my blog has a very rich artist population. In nice weather it's wonderful to wander downtown and listen to street musicians and looks at various items made by local artisans. Looks like it was a beautiful sunny day too! 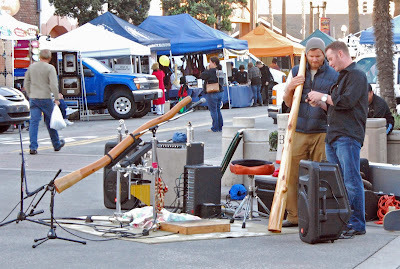 I always enjoy street fairs and that's great living somewhere that they are an ongoing event. I enjoyed all the shots and the quotes are great. Nice selections once again. I'm so glad it's daylight savings time again... More ops for skywatching! 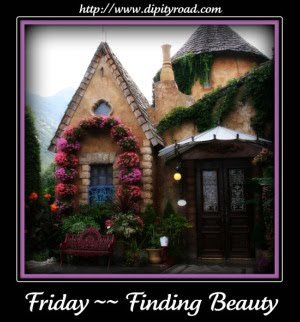 A lovely nourishing post with great quotes and beautiful photos. HRG: What a neat look at a Summer activity for us.